Dave Cornelius stoops to enter the Home of Snoek en Patat, Goedverwacht’s local coffee shop that also functions as the heart of the little village, at least as far as the youth is concerned. He can’t be more than 22 years old, but he smiles and confidently holds out his hand for me to shake. He’s been hastily recruited to come and talk to the English woman who has graced the premises after being directed to the coffee shop by a couple of the local kids, in search of a little more knowledge on the village. Goedverwacht is something out of Eden. 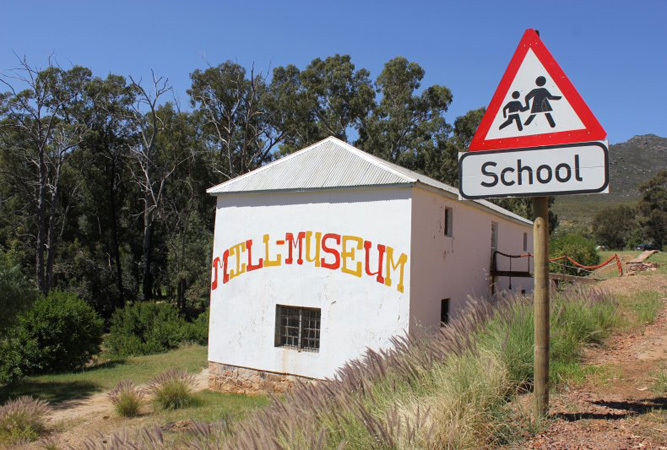 The little dorp – where colourful fruit trees and gardens line the main road through town – lies around the back side of the Piket Mountain with a river running through it. It’s gorgeous, but don’t tell too many people. 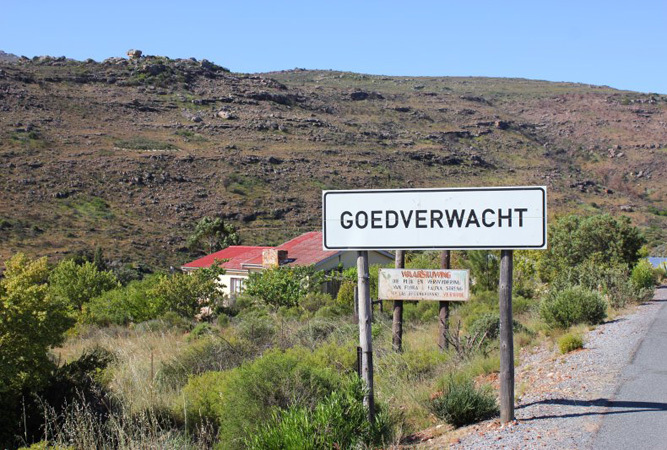 Actually, on speaking to Dave and having discovered in his words, that there is “more to Goedverwacht than meets the eye”, you should not only tell people but visit as well, as there is little marketing material to tell you otherwise, and Goedverwacht is a village worth exploring. The history too is colourful. 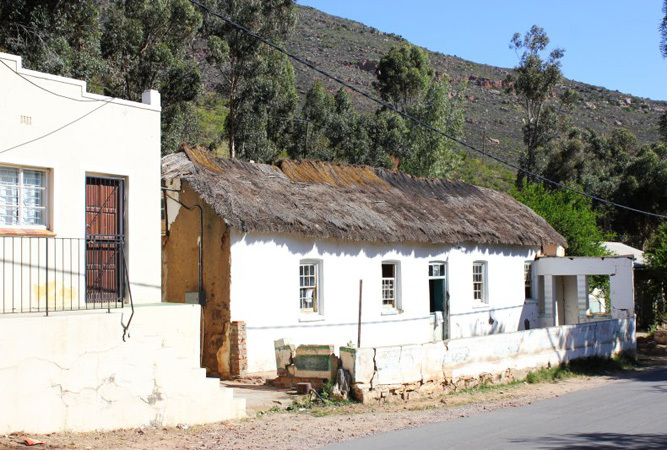 The village was originally a farm called Burgershoek, owned by a Hendrik Schalk Burger, who, in his old age, was cared for by Christiana Maniesa, his slave, and her five children after his progeny had all but abandoned him. In thanks, he left the farm to Maniesa with the proviso that the farm remain her property until her death. Burger’s children of course took the case to court, but the will was very clearly and carefully thought out and the judge found in favour of the former slave. 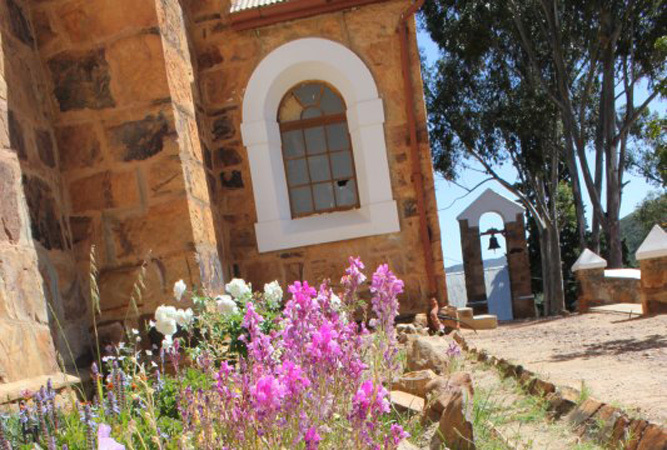 In 1845 the Moravian missionaries were already interested in the farm – who wouldn’t be, it is beautifully situated and well watered; an idyllic part of the Cape – but Christiana died only in 1888, keeping them waiting. In the interim, and this explains the presence of the little dorp just down the road known as Wittewater, the missionaries bought the adjoining farm. 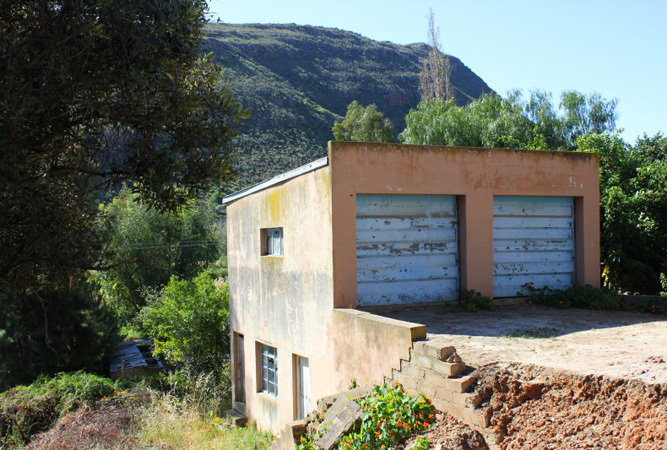 The property remains in their hands and the present day Goedverwacht village is what evolved out of the Goedverwacht mission station – the church still a stalwart presence. Dave’s mom is a teacher at the school that turned 100 years’ old this year. She, like many of the people in the village, realises the importance of investing in the future of the children. So Dave has just returned from a stint in Cape Town where he studied a stream of courses that included business management and something to do with computers – I don’t catch it all. But the obvious intention is there. Children are the future. They are sent to primary and high school in the village, and tertiary education is recognised as an important way in which to better themselves. And for fun. Well, that’s where Dave comes in. He helps run the Development Forum in Goedverwacht, based at the coffee shop – it’s kind of like Sewende Laan but in a village. Kids need a hang out. And since Goedverwacht doesn’t do drugs, and there isn’t a mall, the forum added a roof over a portion of sand along one side of the coffee shop, where kids can pull up chairs and play games like dominoes, which they’re doing as Dave and I speak. When I walk past them, I even get the odd saucy ‘en waar gaan Tannie?’ (where is auntie going) flung in my direction. Dave talks enthusiastically about the Heritage Festival the village celebrated just a couple of weeks back. With the school’s centenary, the village celebrated with traditional dances, a huge party, and plays performed by the youth about their history. I’m just about to suggest to Dave that the village really needs to get its marketing in gear when he mentions that this year’s annual Snoek and Patat Fees saw 10 000 people turn out to take part in the festivities that include a series of market stalls right here at the coffee shop, the back side of which is a gorgeous garden. I’m fairly impressed. Even more so when Dave begins to list the various tourist attractions in Goedverwacht. The village calls itself a ‘sustainable working village’ and there are numerous gardens and organic vegetable gardens to explore, the old Mill Museum where the history of the village is enshrined, the old stone church that sits beautifully on a little hill above the road, opposite the water mill. Two houses have recently been built to offer accommodation for visitors on a self-catering or B&B basis. Each of them has a cosy fireplace and sleeps up to six, but Dave assures me that there are also another couple of options within the villagers’ homes too. 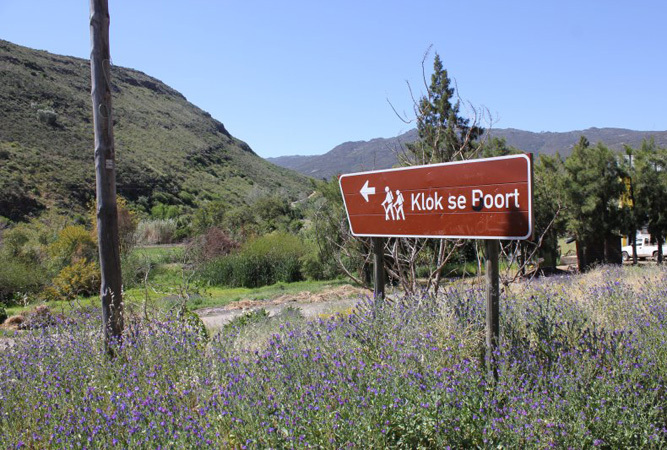 There is an annual Easter flower market that attracts hundreds of visitors, and there are cycle routes and two incredible hikes in the area – Klok se Poort and the Peerboom Route, each of which can be guided by villagers. Dave runs a local bicycle programme too. He has a series of bikes that he rents out at a ridiculously low rate of R2 an hour, but he says it must be affordable for the local kids. All he needs to make from it is enough to maintain the bikes. They sometimes go on drives up to the farms in the hills, in similar fashion to the marathons they see on television. He’s also involved in trying to rescue the youth soccer players. It appears they’ve been thrown out of the village field by the local rugby team and came to the forum for help. Dave is in the process of formally writing to the church about using space on the rugby field for the avid soccer fans. I take a look out to the fynbos covered hills and drink in the unspoilt natural vegetation around me, surrounded by chatting villagers, and I can think of no reason why anyone born here would even contemplate leaving. I am so blessed to grow up in this harmonious humble village and raised by the elders in Goedverwacht who instil all the Christian values in me. This unique village use to bring out the best in you. You go Goedverwacht. Make the circle bigger. GOEDVERWACHT LAID THE FOUNDATION FOR WHO I AM TODAY.THATS THE CLOSEST TO NATURE THAT YOU CAN LIVE. Goedverwacht is the most amazing place I have written a lot of poems about it and the school I love living here and will never leave this place I was raised here and will die here..You got to love Goedverwacht and if you have not check it out you must come. 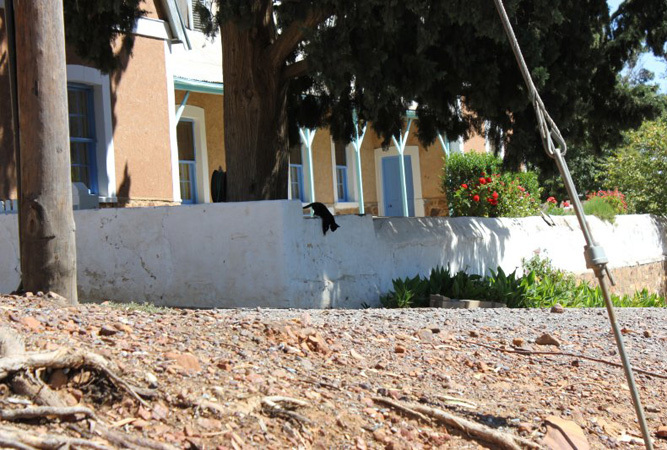 I was lucky enough 2 b born n raizd in goedverwaght….sumday i hope 2 return n live der agen!